Your rugs receive a lot of traffic, wear and use every day and get dirty or worn-down very quickly. That’s why professional rug cleaning is very important. You can trust our technicians to deliver superior service and provide expert care when cleaning your rugs and fine textiles. Champion Chem-Dry has years of experience in cleaning cotton, silk, synthetic and wool area rugs. The service utilizes innovative, industry-best equipment and is eco-friendly, safe for children and pets and certified. Plus, we guarantee satisfaction! The process starts with a thorough inspection of your rug to determine its construction and fabric in order to provide the proper care and cleaning techniques to clean and protect your rug. In some instances, we will require to bring the rug back to our location for a more thorough and in-depth cleaning process. Next, our technician vacuums your rug so that all of the visible pet hair, dirt and solid stains are eliminated prior to applying our cleaning solution and beginning the deeper cleaning portions of the service. We then spray The Natural, our FDA-approved, non-toxic solution over the surface of your rug. The solution permeates into the rug fibers and lifts embedded dirt for extraction. The HCE cleaning process entails heated suction that extracts dirt and contaminants brought to the surface from The Natural. HCE is recommended by rug and carpet manufacturers and has received The Carpet & Rug Institute Seal of Approval. After cleaning is complete, we rake the rug so fibers rise and dry faster. We also hang the rugs to release moisture quickly. Questions? 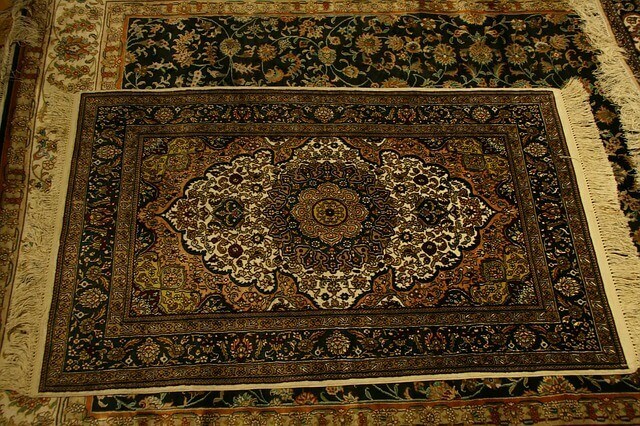 Please call (813) 780-8464 or fill out our online form for a FREE ESTIMATE on the price of our rug cleaning service. Champion Chem-Dry carpet cleaning delivers superior results using cleaner and healthier methods. Our upholstery cleaning service relies on low-moisture processes and innovative equipment. Certified tile cleaning and stone cleaning removes bacteria from grout and restores shine. Trust Champion Chem-Dry for commercial carpet cleaning in Tampa, FL and nearby neighborhoods. Our technicians remove common carpet stains and difficult ones too with proven methods. Discover the power of P.U.R.T.®, our revolutionary pet urine removal treatment for carpet. The Chem-Dry granite countertop renewal service eliminates bacteria and revitalizes granite. Are You on Facebook? “Like” us for online coupons, cleaning tips, local news and more! Previous customer? Please share your experience with us here. Your feedback is extremely valued!